The 2014 modernized holiday home is located on a 350 sqm separate recreational property within a small holiday village, about 400 m from the lake Fürstenseer. Up to the nearest swimming area is about 900 m. The small cottage has kitchen (upholstered seating area, flat-screen TV, Radio, electric stove, refrigerator with freezer part, microwave), bedroom (double bed), alcove with sofa bed and shower / WC. It is heated by a stove. In the bedroom and bathroom E-Additional radiators are mounted. 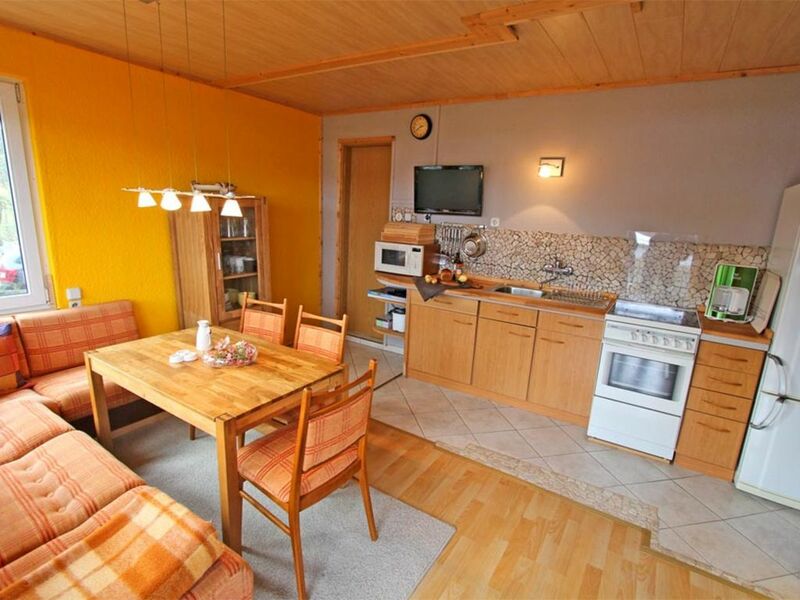 There are furnished, covered terrace, sun loungers, barbecue, parking space and Fahrradunterstellmöglichkeit. Rent a canoe by arrangement. The total price includes bed linen, water, energy, final cleaning and firewood. Towels must be brought. Die Unterkunft ist super gemütlich. Die Unterkunft ist sehr gemütlich und ruhig gelegen. Die umliegenden Wälder und Seen laden zu vielen Spaziergängen ein. Wir kommen auf jeden Fall wieder. Der Blick auf den See ist herrlich, die Nähe zum Naturschutzgebiet, Wald und Wasser ist ideal. Das Ferienhäuschen ist klein und fein. Sehr hell und freundlich, aus dem Bett konnten wir die Sonnenaufgänge sehen! Mein Hund hat sich riesig gefreut einen Garten zum Spielen zu haben. Fürstensee, a district of the city of Neustrelitz (5 km), is set in beautiful forest and lakes. The lake of the same has excellent water quality and is one of the most popular swimming lakes throughout the area. Natural beaches in the resort. Through the village leads "Mecklenburg Lakes bike path" that leads to 640 km from West Mecklenburg up to Usedom. Therefore, good conditions for cyclists. Wellness Institute as well as organic and riding in the village.